MOSCOW, November 9. /TASS/. Sedan and limousine versions of Russian-made Aurus executive class cars will make their European debut during the 89th International Motor Show in Geneva in March 2019, the Russian Industry and Trade Ministry’s press service said. 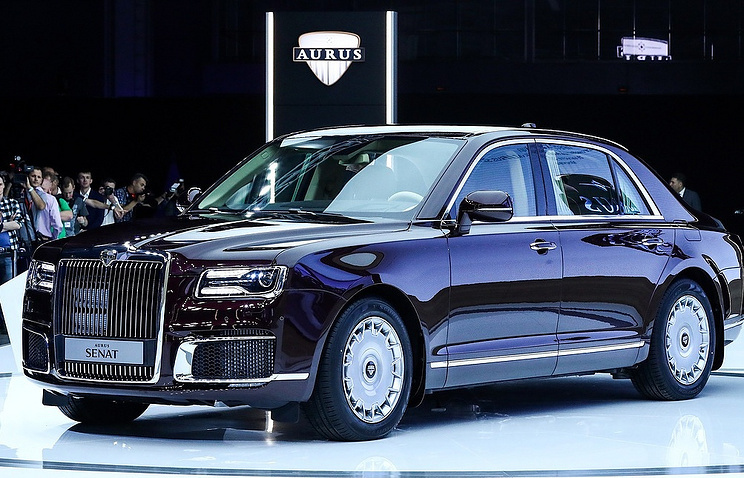 "A decision has been made that Aurus executive class cars… will premiere in Europe as part of the international car show in Geneva," the ministry’s press service quoted Minister Denis Manturov as saying in a statement. "Considering the present demand for those cars and pre-orders already made for the next two years, one may expect that the premiere of this brand will be an important event of the Geneva Motor Show." Aurus cars have been unveiled to the public twice earlier this year. First, an Aurus limousine was used during the inauguration of Russian President Vladimir Putin on May 2018. Then, the cars were put on display during the Moscow International Auto Salon on August 29, 2018. As the newspaper Kommersant reports in an article by Olga Nikitina, the GAZ Group will be supported through the Rosgvardia. It is planned to allocate 2 billion rubles for this purpose. sanctions. Rosguards offer to allocate 2 billion rubles. until the end of the year for the purchase of equipment of the Ural automobile plant and the Arzamas engineering plant, which are part of the group and Russian Machines, respectively. Another 1.5 billion rubles from the government’s reserve fund, the ministry wants to direct the provision of discounts to natural gas cars buyers. TONAR has is a new giant road train! The three-axle off-road supercar TONAR-7502 tows two dump trailers. The total mass of the three-stage hitch is almost 200 tons, the load-carrying capacity is 127 tons, the engine power is 760 hp!